We’ve got an updated solicitation and a release date for The Fury of Firestorm #1! Who are the “Dog Team” and what is the “Firestorm Protocol”? Things are getting more and more interesting! Jason Rusch and Ronnie Raymond. These two high school students are worlds apart – and now they’re drawn into a conspiracy of super-science that bonds them forever in a way they can’t explain or control. The dark secrets of the murderous Dog Team and its Firestorm Protocol force them to put aside their differences to confront a threat so terrifying that it may lead to a new Cold War! Welcome to a major new vision of nuclear terror from writers Ethan Van Sciver and Gail Simone with astonishing art by Yildiray Cinar! 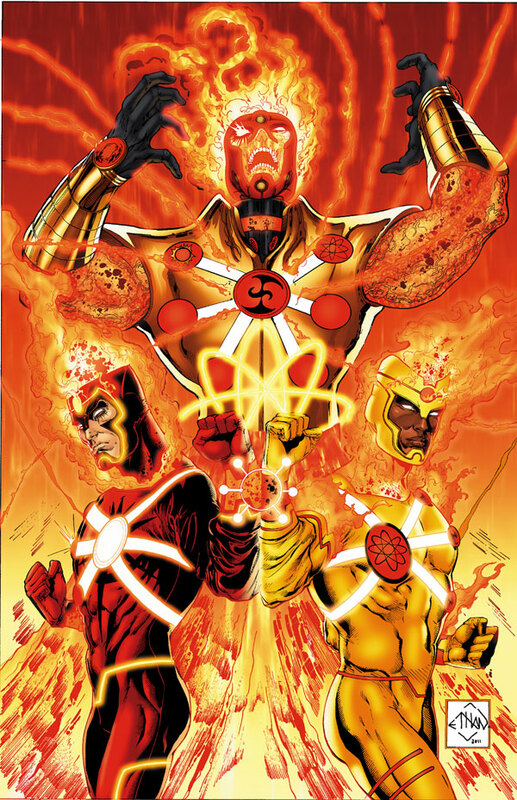 Also, check out this Ethan Van Sciver interview on MTV Geek about the new Firestorm! It’s a great time to be a fan of ole match-head! Posted in: Ethan Van Sciver, Firestorm comic vol. IV, Gail Simone, Yildiray Cinar. Wow! I had no idea. I think she’s more active on Twitter, so that might be the best place to catch her comments. Gail Simone tweeted a few nights ago that Fury of Firestorm will have as much world-building and expanding of the “mythos” so-to-speak as Green Lantern when Johns and EVS started “Rebirth”. Gonna take a Lotta building. Most of MatchHead’s colorful Rogues Gallery met their fate in John O’s Suicide Squad days. I think it’ll have a lot to do with those four blank circles on “Superstorm”‘s torso and Van Sciver’s comment about redefining the nature of Firestorm’s powers. @ Shag–wonderful new headers on the page. (I think that’s the proper term). They look great. @ discussion–certainly this reboot–villians, powers, hero(es), blank circles–and all will be interesting. Can’t wait. @Keith – The good news is in this relaunched universe, all those deceased villains are fair game again! @Spinks – Thanks for noticing the new headers! I’ve pulled together two of them based upon the new FURY OF FIRESTORM cover. My blog template randomly-chooses a header every time you visit. There are about 10 different headers that could come up. Hit the refresh button a few times and the header should change. It’s one of the ways I celebrate all the various Firestorm incarnations.